Nepal aim to keep momentum in T20I series. After surprising the Emirates in ODIs, the Nepal brigade will aim to replicate it in the T20I series. As for now, both the nations are set to face each other in the first T20 international fixture on Thursday, January 31. Meanwhile, this will also be the inaugural T20I faceoff between these two nations. Nepal men have played 12 completed T20I fixtures with three wins and nine losses. Though their recent T20 record doesn't support their cause, they are coming on the back of an impressive ODI series victory against the hosts, which should give them confidence and momentum heading into the series. Nepal skipper Paras Khadka led the batting charts and smashed 156 runs in the previous ODI series against the same opponents including a match-defining century in the third ODI. The skipper is in good touch and will be eager to play a similar role in T20s. Because Aarif Sheikh and Gyanendra Malla also played key roles during ODIs, these two are expected to pose a major threat to the UAE bowlers. Sompal Kami topped the wickets charts in the ODI series with seven wickets in three games, while Sandeep Lamichhane also followed him on second position with seven wickets. These two will get management backing to replicate their show in the shortest format. Paras and Karan also shared eight wickets between them and are likely to challenge the hosts in middle overs. 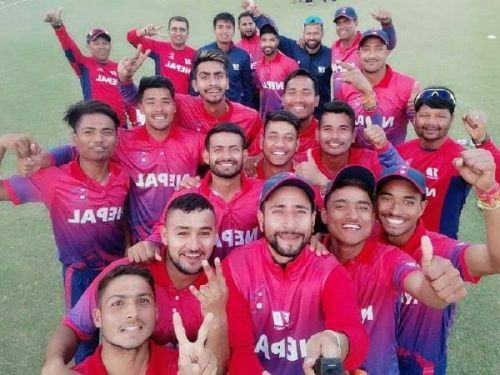 Paras Khadka (C), Aarif Sheikh, Sompal Kami, Dipendra Airee, Karan KC, Sandeep Lamichhane, Gyanendra Malla, Rohit Kumar, Basant Regmi, Aarif Sheikh and Avinash Bohara. UAE eye revival of fortunes in the shortest format. The Emirates clearly missed the services of their regular skipper Rohan Mustafa during the ODI series and have tried a lot of things in his absence, but nothing seems to have worked for them. UAE batting will rely mainly on Shaiman Anwar. He is their most experienced campaigner and has featured in all 27 T20I games for UAE and has scored 788 runs for his team at an average of 31.52. He was the only batsman to show some resistance against Nepal during the ODI series and scored 98 runs in three games. If UAE need to have any chance, then this man will have to level up his performance and score a big knock in T20 fixture. Skipper Mohammad Naveed and Muhammad Usman had an awful outing during the ODI series and they will be eager to rectify that in the T20s. Imran Haider and Amir Hayat were their key wicket takers during the ODIs with seven and six wickets respectively and the skipper will need them to apply pressure and snare few scalps early on. Ashfaq Ahmed and the skipper himself are the other players in the lineup with the ability to take wickets, whereas Naveed is the team's leading wicket-taker in T20I. Ahmad showed few glimpses of his talent in the ODIs, and he and Naveed will be seen playing key roles in bowling. Mohammad Naveed (C), Ashfaq Ahmed, Chirag Suri, Mohammad Boota, Shaiman Anwar, Qadeer Ahmed, Imran Haider, Muhammad Usman, Amir Hayat, Ghulam Shabir and Zahoor Khan.